Home Outdoors Why did the turtle cross the road? ANNA MARIA – She was lost. She was pregnant. She just wanted to get home. The loggerhead sea turtle came ashore on Wednesday, May 13 at Bayfront Park, probably to nest. 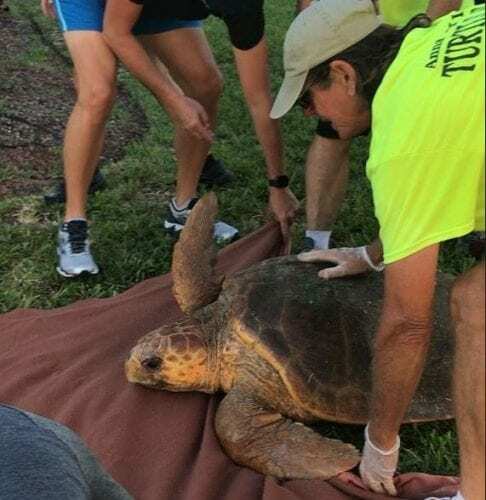 But apparently, she didn’t find a favorable spot, because she just kept going, according to Anna Maria Island Turtle Watch and Shorebird Monitoring Director Suzi Fox. First, she crawled up North Shore Drive. Possibly wondering why the sand had turned to something hard that flippers couldn’t dig into, she headed back to the park. Then she crawled down North Bay Boulevard. No good sand there, either. Meanwhile, Turtle Watch volunteer Karen Anderson had saddled up for morning turtle surveys and was noticing turtle tracks that came ashore, but no signs of nesting and no tracks going back to the bay. Like the cavalry, Bob and Debbie Haynes and Lisa Weiss came to the rescue. They tracked down the 400-pound turtle, coaxed her onto a sheet, picked her up, carried her to the park, sat her down on the beach and pushed her back into the water, Fox said, thrilled that all the volunteer training had paid off in a successful crisis management example for the turtle record books. The next day, volunteers discovered a nest near Bayfront Park. Did the rescued turtle come back to nest the night after her ordeal? But in 1997, a turtle got lost in the same spot, Fox said. No telling if it was the same turtle, or if the area is just bad turtle terrain in need of a turtle crossing sign. If you find a sea turtle on the road on Anna Maria Island, call Turtle Watch at 941-778-5638.